Almost-fifteen-year-old Adam meets Robyn at his group therapy session for teens with obsessive-compulsive issues. It’s hardly the setting for romance, but Adam can’t deny how he feels for her. Robyn seems drawn to him, too. Maybe. But while Robyn’s most troublesome days seem to be behind her, Adam’s life continues to spiral out of control. He’s at the mercy of his half-brother’s anxiety issues, and his mother refuses to get help though the threatening letters she receives only seem to be getting worse. As Adam desperately struggles to hold everyone together, he begins to split at the seams. But it may be the voices of his Group mates which bring him the strength and courage to face greater truths about his family, his condition, and himself. Adam faces a lot of challenges related to his obsessive-compulsive disorder, from counting to threshold issues. While his OCD is an important and ever-present element in the story, it doesn’t dominate who Adam is. He’s also kind, funny, loves selflessly, and is wholly devoted to his family. Each member of Adam’s family and community circle comes across as complex and essential to the tale as well. Toten doesn’t leave readers with a neat and tidy ending, all loose ends wrapped up, either. I felt that this added to the sense of realism in the story. Though there’s a sharp change in Adam’s OCD as the story resolves, other threads are left hanging, blanks for the reader to fill. Fans of Belzhar by Meg Wolitzer and Finding Audrey by Sophie Kinsella need to give this novel a read. Strong profanity used moderately throughout the story. Adam teaches Robyn about Catholicism. He and his group mates visit the Catholic church Adam and his mother used to attend, and he explains various rites and rituals, including praying the Rosary, genuflecting, lighting candles, etc. There’s a brief discussion about whether it’s appropriate for non-Catholics to enter the church. A few of Adam’s friends are Jewish. Adam prays desperately at one point. Adam’s mother receives disturbing letters in the mail. While they don’t directly threaten her, they’re cruel and deeply upsetting to both her and Adam. Adam is responsible to monitor his own dosage of medication. As his symptoms worsen, he responds with increasing his medication. He and his friend Ben celebrate the New Year by guzzling Red Bulls until they’re ridiculously buzzed from the caffeine. Then they crash and sleep until the following afternoon. 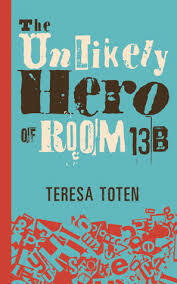 Tagged Children's Literature, Group Therapy, Obsessive Compulsive Disorder, Teresa Toten, The Unlikely Hero of Room 13B. Bookmark the permalink.